I began playing mountain dulcimer when my then-new sweetheart, Colorado guitar builder Max Krimmel made me a dulcimer for Christmas in 1971. At the time, I was working in the mental health field, but I had played music since I first accompanied my mother on piano (whether she wanted me to or not) at age 4 - after piano and guitar, the dulcimer came easily, and several decades later, came African marimba. Here’s a summary of how all this fit together into a life. In 1972, funding in the mental health field underwent one of its intermittent cuts, and I lost my job of the time, working for a state mental hospital. By then Max had mystified me with the fact that he went to a lumberyard, bought boards, and made them into guitars. In just a few months we had driven to Alaska via the (at that time) unpaved Alcan Highway, and were on the way to a stunning life together. I say this now as we celebrate approximately four decades - our last big project was building a house with an 800-square-foot music studio and a 1000-square-foot workshop. The living space in the house sometimes seems incidental - oh yes, there's a bedroom, a kitchen, and a living room. Now we can really play music and make things (including dulcimers and marimbas) seriously. But back to 1971 when I lost my mental health job, and Max said, innocently enough, "I could show you how to make dulcimers and maybe you could do that for a living." And so began a saga: "Well trained mental health professional becomes gypsy musician and crafts person." I built a few dulcimers, sold them, and after a couple of years and 20 or so dulcimers, I thought, "Time to get a real job in the field where I am trained - psychology." But just before I launched this job hunt, I saw a notice in the 1975 Dulcimer Player's News about the first Kindred Gathering. After attending the festival on the rainy Olympic Peninsula of Washington state, I immediately executed an about face before I ever got to that ill-fated job hunt: dulcimer players were the people with whom I wanted to spend the rest of my life. I observe that psychology is a fascinating field, and playing music is a great pastime. These observations would lead most people to get a psychology degree and play music as an avocation. I got it backwards: music vocation - psychology avocation. After this, the first Kindred Gathering, took my heart away, I began doing whatever I could to make dulcimers into a decent living. I built dulcimers, wrote books, taught dulcimer at the Denver Folklore Center, and the Music Association of Swallow Hill, performed on the dulcimer, produced a radio show at Boulder’s fabulous community public radio station, KGNU, of all the music I could find out there in dulcitopia - it was named (what else?) Dulcimania. In 1977 a Denver record company wanted to make a mountain dulcimer record, and I organized the Pacific Rim Dulcimer Project crew to do this recording from my experiences with the Kindred Gathering crowd. The recording is out of print, and Albert d'Ossché has passed on, but the rest of us remain life-long friends: Neal Hellman, Robert Force, Michael Rugg, Michael Hubbert, and me. Turns out after I made this recording, people began to imagine I was a musician so I began behaving as one: I toured these United States playing music for a decade or more. I went East first, and met the wonderful traditional music scene and the dulcimer players there - Maddie MacNeil, Keith Young, etc. After my first trip to the Cosby dulcimer gathering, I began touring with David Schnaufer, later with Larkin Bryant, and even later with Mark Nelson. Even more than I toured with others, I performed solo. During this next decade, I spent about half of every year in Colorado, booking tours, playing in Colorado bands, and building more dulcimers. I had an uphill battle performing and teaching on the dulcimer in Colorado - I remember when the owner of a local coffeehouse where I hoped to perform asked me tentatively, "a whole evening of dulcimer music?" Another memorable performing situation was the Bonnie (Carol) and Bonnie (Phipps) Generic All Purpose Folk Variety Show that all Bonnies could attend for free. And I played in a Celtic Band at the local Irish pub, and played square dance and contra music for the local old time dances. For twenty years I performed with Colorado's Motherfolkers, a group of 10-15 women who put on the best-selling folk music show in the state once each year. After a 25-year run, the group called it quits, but the last CD I made with the group is still available (Confluence: The Motherfolkers). It was quite a time, and still is - I still play in many of these situations while I'm here in Colorado. In 1980 I recorded and wrote the book of music for my first solo mountain dulcimer recording, Fingerdances for Dulcimer (still available). I mostly learned to play hammered dulcimer on the streets of New York City - I found that with five or six songs and some LP's I could make a dependable $100-200 an hour in front of Trinity Church or the Met. I engaged in this work-study program for a month or so and next thing you know, I could play the hammered dulcimer tolerably. Probably a lot of this success on the streets of New York could be attributed to my dulcimer - it was the four string per course monster built by Dana Hamilton which had the most beautiful and loud sound, and as I mentioned, it only weighed 47 pounds. I had no need for weightlifting at that time in my life. I probably looked like someone's country cousin (or niece - I weighed only about twice as much as the dulcimer, and was I innocent! I remember a little old lady about 4 feet tall learning over and whispering to me once, "Dear, you have too much money in your hat. Put some of it in your pocket.") I found New Yorkers universally helpful and protective and had a wonderful time in the Big Apple. 1986 brought my first solo hammered dulcimer recording - the concept recording, Laughing Willow. The concept? Why, travel of course. And nature, which is my second love following music closely. Maybe third next to Max and music. I most enjoy the doors music and the dulcimer open for me - and I love to travel. For example, I had some of my most memorable life experiences with the dulcimer in Central America. In 1988, I saw a notice in a local arts calendar about an arts brigade to Nicaragua. I was lured to Nicaragua with 10 or so other musicians, actors and visual artists, and we spent a month in the country creating a performance with our Nicaraguan counterpart musicians, actors and artists and performing it in the community arts centers throughout the countryside. During the several weeks we were rehearsing in Managua, capital of Nicaragua, we had a house with a large front porch and the word traveled through the music community of the city that we had music happening on the porch every night. Musicians from all over the city would drop by and we played late into every night. I've never been the same - this experience enlarged on my early days growing up in Texas surrounded by the Tex-Mex border culture, and I have become interested in Tex-Mex conjunto music, and music of the Caribbean, as well as the rest of Latin America. This experience inspired my fourth recording, Celtic Caribe, NOT named for a New England basketball team, but for the Caribe Indians and a favorite musical genre. It's more varied than previous recordings: I play both dulcimers, sing, play marimba, and congas. I wrote Celtic inspired songs with Caribbean rhythms played on Afro-Cuban percussion. So far, I haven't found a sort of music that I can't play on dulcimer, at least not one that interests me. So, I'll try anything! Why not! My next recording was also on the hammered dulcimer, The Very Top of the Tree. 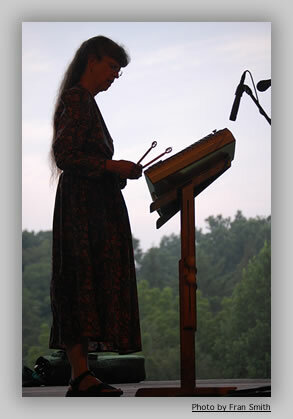 All the time I was recording and performing on the dulcimers, I was teaching dulcimer. Sometime during this time, in the 80s I suppose, computers took every field, even music, by storm. I began writing out music for my students and publishing it. As difficult as it is for a musician to admit it, I enjoyed my time at the computer composing and transcribing music for my students. This work eventually became a half dozen books about the dulcimer. Something that is clear to me about adult students of music – they usually learn to play music because they want to play with others. That can certainly be said of me – playing music with others is my favorite activity with music. This led me to add a distinctly social and group slant to my teaching. We learn to arrange in groups, we play for each other, and we performed in the Denver metro area as The Dulcimer Orchestra. That's the story of how I first heard, heard of, built and played dulcimers. It's been as much fun as anything I've ever done in this short life. Next, ask me about rafting the Grand Canyon with dulcimers in tow – another life-changing adventure. I work daily on finding more ways to live in the wilderness and be connected to the music community simultaneously… the first step was to get hired as the resident musician on a canoe trip on the Gunnison River in Colorado. Twenty of us river runners had seven fretted dulcimers, three hammered dulcimers, and two guitars, a raft, a bunch of canoes, and some great food which we took for three days of camping, hiking, canoeing, swimming, singing and playing songs around a campfire. It was enough fun that I started the yearly Moons and Tunes Wilderness River Trip – we gather our instruments and raft on the great desert rivers of the Colorado Plateau. It’s been 20 years and still going strong. The beginning of the century finds me making a living playing and building dulcimers, running rivers, hiking, cross country skiing, and exploring Zimbabwean music on marimba. Marimba? I guess it was a natural progression. I’ve always been interested in cultures other than the one I hail from and when I found Nicaraguan and Costa Rican musicians playing marimbas I thought, “I could do that!” Marimbas are, after all, a cross between the keyboards of piano and the percussion of hammered dulcimers. I returned to Colorado to find not a Central American marimba scene going strong, but rather an African one – specifically music of Zimbabwe. I traded marimba and hammered dulcimer lessons with Mary Ellen Garrett and before long we had started a Zimbabwean style marimba band named Chimanimani. After a several year run, Max built a set of the seven marimbas (including the Giant Fan Bass) for our own studio here in Nederland, and in the late 90s we began another marimba band, Zebra Marimba. I taught several marimba classes over the years, and the last one became the Wild Okapi Marimba Ensemble. And as astists must do, this changed as well: the band found we had experienced what we came for in marimbas and the ensemble morphed into a group of friends and out of marimba playing. Again my transcription and computer skills have led me to write the marimba music down, and these marimba books are also available. Well … what a life so far. I have gotten to spend the majority of my lifetime engaged in pursuits that involve music and art, wilderness and travel, and that hopefully make our world a more sustainable and peaceful place. I believe fervently in the power of creativity, art, and connections with people to improve the world, and I continue to be delighted with all these involvements. What a time!